Gurinder Chadha was born in Kenya and came to Britain with her parents in 1961. She grew up in Southall, London and studied at the University of East Anglia. After working as a broadcast journalist, her first directorial venture was I'm British But... , a documentary made for Channel 4 and the BFI in 1989. The film uses the phenomenon of bhangra music to explore issues of identity and belonging among young British-born Asians. In 1990 Chadha made her first dramatic short film, Nice Arrangement , concerning a British-Asian family on the morning of their daughter's wedding. This was followed by another documentary, Acting Our Age (1991), in which elderly Asians living in Southall recount their experiences of living in Britain. These various concerns came together in Chadha 's first feature film, the comedy-drama Bhaji on the Beach (1993). The film centres on the experiences of a group of Asian women from three generations on a day trip to Blackpool. As Chadha has said, in the film "You have tradition on the one side and modernity on the other, Indianness on the one side, Englishness on the other, cultural specificity and universality - but in fact there is a scale between each of these polarities and the film moves freely between them." 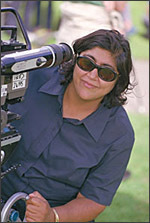 After a two-part drama for the BBC , Rich Deceiver (1995), and a number of television documentaries, Chadha went to Los Angeles to make her next feature film What's Cooking? (2000), a series of overlapping stories involving four families (Hispanic, Vietnamese, African-American, and Jewish), all preparing for Thanksgiving dinner. Once again the film stresses diversity over difference through an increasingly adept mix of drama and comedy. Chadha has said that "For me the whole point of the film is that the four families mirror each other and as you become emotionally invested you forget about where they come from - you stop seeing difference and realise they all want the same thing, to keep their families together. Chadha 's most accomplished and commercially successful film to date is Bend It Like Beckham (2002). This story of a young Asian woman trying to pursue her ambitions as a footballer while accommodating the demands of family and tradition may seem familiar territory. However, the fact that the film is set in Southall, where Chadha grew up, enables her to present a subtly nuanced picture of a very specific community. The film makes the point that British Asian experiences are as diverse as those of any cultural or ethnic group, thereby emphasising the universality of those experiences, a point that is all the more powerful for being quietly made. Bhattacharyya, Gargi and John Gabriel, 'Gurinder Chadha and The Apna Generation', Third Text (Summer 1994), pp. 55-63. Wambu, Onyekachi and Kevin Arnold, A Fuller Picture: The Commercial Impact of Six British Films with Black Themes in the 1990s (London: BFI, 1999).